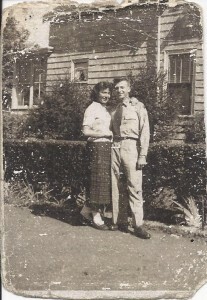 Another cute photograph of my parents (Arlene DeBonis and Joe Motter). I am guessing that this was probably taken in 1953 since my Dad is in his uniform. Is this the house on River Road? From the wear (and size) of this photograph, I am taking a wild guess that this may have been in someone’s wallet for a while. This entry was posted in Family Photographs, The DeBonis Family and tagged Arlene DeBonis, DeBonis family history, Joe Motter, Motter family history. Bookmark the permalink. One Response to What a cute couple! Taken in driveway, River Rd, facing the Dixon home. Cathy DeBonis Regan on What a cute couple!